Carey High School's Charlie Rivera has enjoyed an outstanding senior season in athletics, playing important roles on the Panther state runner-up teams in football and basketball. Now, he's got another feather in his cap this spring in track—as the new school record holder in the triple jump. Rivera broke a 29-year-old school record with a first-place 44-foot and 4-inch triple jump Thursday, April 12 during the 13-school Monte Andrus Invitational track and field meet at Twin Falls High's Bruin Stadium. The previous Carey triple jump record was Neil Parke's 44-2.50 back in 1983. The Rivera jump, a winner by nearly four feet over Lighthouse Christian Academy junior Eli Berndt's 40-7.75, was also a new Andrus meet record. Rivera added the winning 20-9.50 long jump Thursday. Senior Jack Cenarrusa, winning by six inches with a 5-10 high jump, racked up the other Carey boys' gold medal. The Panthers with 73 points tied Wendell for fourth place behind Hagerman (96), Raft River (87.5) and Murtaugh (74). With six gold medals including three relay wins, Carey's girls (89.5 points) made a determined run at meet winner Raft River (100). Raft River outdistanced Carey 44-14 in the field events to prevail. Carey senior Micaela Adamson was a double winner in the 300m intermediate hurdles (51.00 seconds) and the triple jump (32-8.25). Junior Jaide Parke won the 3200m by 26 seconds with a time of 12:49.10 and was a very close second (6:06.50) to Wendell freshman Madi Kelcey in the 1600m. Adamson amassed 25 points and Parke 24 of Carey's 89.5. The winning Carey relay teams were 4x100m with Daphne Kirkland, McKayla Mecham, Arriana Nielson and Angelica Zarate (55.70); the 4x200m with Kirkland, Mecham, Zarate and Adamson (1:55.70); and sprint medley girls with Kirkland, Mecham, Zarate and Adamson (2:00.10). Comparing the Carey marks to Idaho's best on athletic.net: Rivera's 44-4 triple jump is the top 1A mark and third overall among all classifications; Rivera's 21-2.50 long jump is the top 1A mark and ninth in all classes; Jack Cenarrusa's 5-10 high jump is fourth-best in 1A; and, in 1A, the Carey girls' 4x200m is third best and the sprint medley is second best. Carey hosts its first Northside Conference meet of the season Thursday, April 19 at Derrick Parke Memorial Field. Teams: 1—Hagerman 96 points (36 sprints, 0 hurdles, 19 distances, 26 field, 15 relays). 2—Raft River 87.5. 3—Murtaugh 74. 4—Carey 73 (3 sprints, 7 hurdles, 2 distances, 45 field, 16 relays) and Wendell 73. 6—Lighthouse Christian 63. 7—Castleford 56.5. 8—Dietrich 34. 9—Glenns Ferry 28. 10—Wells (Nev.) 26. 11—Valley 21. 12—Shoshone 20. 13—Jackpot (Nev.) 7. 200m: 5—Jack Cenarrusa (C) 23.70. 800m: 7—Jake Purdy (C) 2:22.50. 110m high hurdles: 4—Dillon Cenarrusa (C) 17.10. 7—Tori Alvarez (C) 19.10. High jump: 1—Jack Cenarrusa (C) 5-10. Long jump: 1—Charlie Rivera (C) 20-9.50. 3—Luis Garcia (C) 19-5.50. 7—Tori Alvarez (C) 18-4. Triple jump: 1—Charlie Rivera (C) 44-4. 4—Luis Garcia (C) 37-6. Shotput: 7—Francisco Gamino (C) 39-2.50. 4x100m relay: 6—Carey (Tori Alvarez, Jordan Dilworth, Luis Garcia, Christian Zarate) 48.40. 4x200m relay: 4—Carey (Christian Zarate, Chance Chavez, Charlie Rivera, Jack Cenarrusa) 1:39.50. Medley relay: 5—Carey (Dillon Cenarrusa, Jordan Dilworth, Christian Zarate, Jake Purdy) 4:12.40. 4x400m relay: 5—Carey (Dillon Cenarrusa, Jordan Dilworth, Jake Purdy, Luis Garcia) 4:05.00. Teams: 1—Raft River 100 points (9 sprints, 16 hurdles, 0 distances, 44 field, 31 relays). 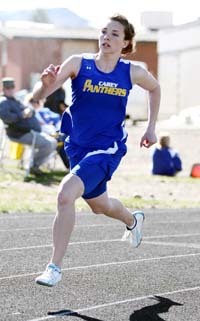 2—Carey 89.5 (11.5 sprints, 10 hurdles, 24 distances, 14 field, 30 relays). 3—Castleford 68. 4—Hagerman 67.5. 5—Valley 65. 6—Wendell 62. 7—Wells (Nev.) 56. 8—Shoshone 44. 9—Jackpot (Nev.) 25, Dietrich 25 and Murtaugh 25. 12—Lighthouse Christian 11. 13—Glenns Ferry 7. 100m: 3—Daphne Kirkland (C) 13.90. 5—Arianna Nielson (C) 14.40. 8—Evelyn Gomez (C) 14.90. 200m: 8—Arianna Nielson (C) 30.70. 800m: 3—Jaide Parke (C) 2:45.10. 1600m: 2—Jaide Parke (C) 6:06.50. 3200m: 1—Jaide Parke (C) 12:49.10. 300m intermediate hurdles: 1—Micaela Adamson (C) 51.00. Triple jump: 1—Micaela Adamson (C) 32-8.25. Discus: 5—McKayla Mecham (C) 77-11. 4x100m relay: 1—Carey (Daphne Kirkland, McKayla Mecham, Arriana Nielson, Angelica Zarate) 55.70. 4x200m relay: 1—Carey (Daphne Kirkland, McKayla Mecham, Angelica Zarate, Micaela Adamson) 1:55.70. Sprint medley relay: 1—Carey (Daphne Kirkland, McKayla Mecham, Angelica Zarate, Micaela Adamson) 2:00.10. On a rainy Wednesday, four members of the Community School track and field team coached by Peter Webb joined prep athletes from six other Idaho 1A small schools at the Northside Conference meet held on the ISDB oval, Gooding. Cutthroats competing in their first meet of the season April 11 were senior Hunter Weaver, sophomore Katie Feldman and freshmen Sydney Hagenbuch and Moyo Tian. They did well in the field featuring Oakley, Hansen, Richfield, North Valley Academy (Gooding), ISDB and Bliss. Hagenbuch (28.40 seconds) won the 200-meter dash by a hefty 1.74-second margin. She was second in 100m (13.20) and third in long jump (13-4.50) to pile up 24 of 42 Cutthroat girls' points. Oakley won the girls' meet 122-107 over Richfield. Tian placed third in the 100m high hurdles (20.62), third in the 100m dash (13.68) and sixth in long jump (12-4.50) for 13 more points. Feldman added five team points with fourth place in 800m run (3:20.62) and sixth in the 3200m (16:01.00). In the boys' meet, Weaver placed third in the 200m dash (25.70), third in the long jump (18-7.50) and sixth in the 100m dash (12.03). He accounted for all of Sun Valley's 13 boys' points. Hansen won the boys' team title 185-177 over Oakley. The Cutthroats compete Thursday, April 19 in another Northside meet, this one at Carey starting at 2 p.m.